On Tuesday 16 May, communicative Mercury moves into slow and steady Taurus, where it will stay until 5 June. This is a good time to have practical discussions about a range of material issues – from budgets, salaries, insurance and investments, to buying property or planning a wedding. After the whirlwind of April and last week’s Full Moon in Scorpio, this week might seem somewhat… calmer. Or is it? That depends on the extent to which we’ve been open and honest about moving forward in our lives. When we set the intention to seek the highest, greatest good, with courage and humility, we can set wonderful things in motion. But if we’re not completely honest with ourselves, the Universe has a way of clapping back that will teach us valuable lessons (at the very least, not to pull that sh*t anymore). So here’s This Week’s Tarot! LEFT: ACE OF CUPS REVERSED. In the upright position, this card represents emotional + spiritual breakthrough, the promise of a new stage of joy and fulfilment; when reversed, this promise hasn’t quite come to pass. The effects of the Full Moon in Scorpio are still reverberating through the cosmos and in our lives – it’s time to ask ourselves what we need to release and transform in order to take our quality of life to the next level. MIDDLE: FOUR OF PENTACLES. What we need to release is the name of the game when this card shows up. 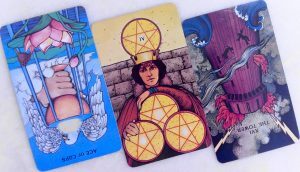 Traditionally known as The Miser’s Card, the Four of Pentacles refers to security blankets and comfort zones that we cling on to, but may have long outgrown without realising. Alternatively, perhaps you’re someone else’s security blanket, and that someone is clinging on to you for dear life and draining you of time, energy, and self-worth. To cling in order to exist, or to let go and live – what will it be? RIGHT: THE TOWER REVERSED. Perhaps you have a choice in clinging versus releasing; perhaps you feel you don’t. It’s all good. Whatever you do, change is coming, and if you insist on clinging, it won’t be pretty. The Tower represents change coming your way. It is Major Arcana XVI, reverberating to the transformative + transcendental energies of 7: this transformation is meant for you to grow. As a Major, it also indicates that forces greater than yourself will be in control of this situation. You might want to consider rolling with the punches instead.